I danced my Ph.D. If you know me, that probably sounds entirely reasonable to you. If you don’t, well… here goes. I made this video to submit to the Dance Your Ph.D. contest, but it turned in to so much more. Now I can’t understand why I waited this long to dance my dissertation! It was a good deal more fun than writing it. The cast of “Fifty Years of the Indonesian Throughflow.” From left to right: Megan Ward, Elisa Stefanski, Maria Liebana, and Serena Spears. I’m the one crouching at the bottom. So here’s the story of how this video came to exist. During my six years at the Lamont-Doherty Earth Observatory, I learned a lot of science. More importantly, I learned to love ocean and climate physics: collecting data, analyzing data, and figuring out what it all meant. But I also learned that I needed breaks from science, breaks in which my mind could focus intently on something else. Through a series of fortunate events, I found Solstice Studio, which became my dance home. My two most important teachers – Professor Arnold L. Gordon and Sera Solstice – never met each other, but I credit them both with making me a more creative person and a better scientist. My Ph.D. research focuses on the Indonesian Throughflow (ITF), which is an important but poorly understood part of global ocean circulation. It transports water and energy from the Pacific Ocean to the Indian Ocean by way of a few narrow passages, the main one being the Makassar Strait in Indonesia. The goal of my dissertation was to create a 50 year history of the ITF from limited observational data, and then to analyze that history. I was able to simulate the transport of the ITF from 1958 through 2007, and found that the main influences on both its volume and energy transport were El Niño/La Niña and a similar Indian Ocean phenomenon called the Indian Ocean Dipole. As you can see from the compass on the ground, the camera is facing north with the Pacific Ocean on the right and the Indian Ocean on the left. The direction of the flow is from east to west, but is not perfectly aligned with the compass because of the angle of the Makassar Strait. I dance the part of the ITF (in blue), which is most strongly influenced by El Niño, danced by Maria Liebana (in white) and La Niña, danced by Serena Spears (in black). To a lesser extent, the ITF is also controlled by the Indian Ocean Dipole. Its positive mode, danced by Megan Ward (in light purple) is generally associated with El Niño, and its negative mode, danced by Elisa Stefanski (in dark purple) is generally associated with La Niña. The ITF has a predictable yearly cycle, which is then influenced by these larger climate phenomena. In this performance, each four-count measure in the music corresponds to one historical year, beginning in 1958. You can therefore see the major climatic events and the ITF’s reaction to them. The movements of each dancer correspond to an actual historical event. Notable among these are the 1982-83 El Niño (very strong), the 1988 La Niña (very strong) and the 2007 simultaneous La Niña and Positive Dipole Mode (rare combination). In addition to transporting water from the Pacific to the Indian Ocean, the ITF transports energy, which we can think of as heat. El Niño decreases both the volume transportation and the heat transportation of the ITF, shown here by El Niño’s slow movements and the corresponding slowness of the ITF, which is then transmitted to the Indian Ocean and effects the Dipole Mode. La Niña has the opposite effect, making the ITF transport more water and warmer water, demonstrated by the fast movements of the dancers during those years. The papers on which this dance was based are published in The Journal of Climate (Tillinger & Gordon 2009) and Dynamics of Atmospheres and Oceans (Tillinger & Gordon 2010). Once I decided to dance my Ph.D., I knew that my goal would be to actually show the fifty years of the Indonesian Throughflow (ITF) that I had worked so hard to produce. To make that happen, I needed dancers who could play the parts of the major climate phenomena that influence the ITF: El Niño, La Niña, and the positive and negative modes of the Indian Ocean Dipole. El Niño brings cooler water to the ITF, slows it down, and causes it to transport less heat. I asked Maria Liebana, who is both a dancer and a visual artist, to dance that part because she dances with both ferocious intensity and slow, deliberate movements. Serena Spears, dancer and instructor of Urban Fusion at Solstice Studio, brought an intensity to the role of La Niña that was necessary to show its heat and strength. The Indian Ocean Dipole is a more subtle phenomenon, one that some scientists suspect of only mirroring El Niño/LaNiña. I think there is strong evidence that it is an independent phenomena, but I needed dancers who could simultaneously convey a sense of mystery and show that the Indian Ocean is more than a passive receiver of water from the ITF. Megan Ward played the positive mode of the Indian Ocean Dipole, the mode that cools the water around the ITF. She is an instructor in both East Coast Tribal technique and Modern Dance at Solstice Studio, and brings a cool intensity and strong technicality to all of her performances. Elisa Stefanski, who plays the warmer negative Indian Ocean Dipole Mode, is also a technique instructor at Solstice Studio and is known and loved by all for her introspective and expressive performances. I also needed music that had a strong, regular tempo and would make for fun dancing. For that, I turned to Beats Antique, the go-to band for tribal fusion bellydancers like myself. Since I already owned all of their music, it was a matter of picking a song with the right beat, which I found in “Tabla Toy.” They kindly gave me permission to use their music in this venture. Here’s another shot of all five of us, reviewing an early take of the piece. My friends and I had a crazy amount of fun filming this, and I happen to think that it’s worth doing something just because it’s fun. But it’s also been a great way for me to share my thesis with all of my friends – people who wanted to understand what is I was doing for the last six years, but who didn’t have a strong background in science. So thanks, Gonzo Labs, for having this contest. Yes, you can use this video for non-commercial purposes, just keep it intact and keep my name on it, please. Feel free to contact me if you want to talk about how we can combine science & dance. Thanks! Well, the idea is to combine science & art. But I think that you should dance your PhD too – even if it’s not for a contest. Or start your own contest for non-science PhDs. 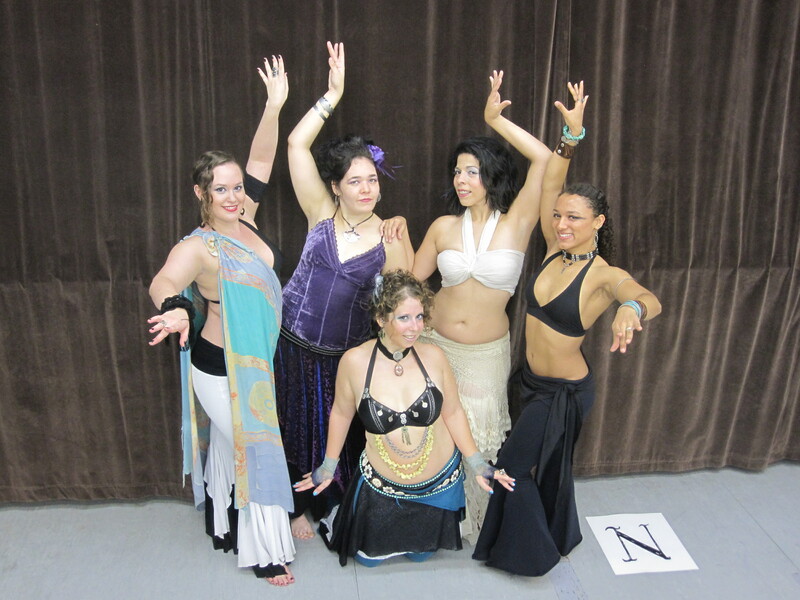 Or better yet: Bellydance your PhD, in any field. You are an amazingly intelligent, beautiful, and creative woman and I am honored to know you.